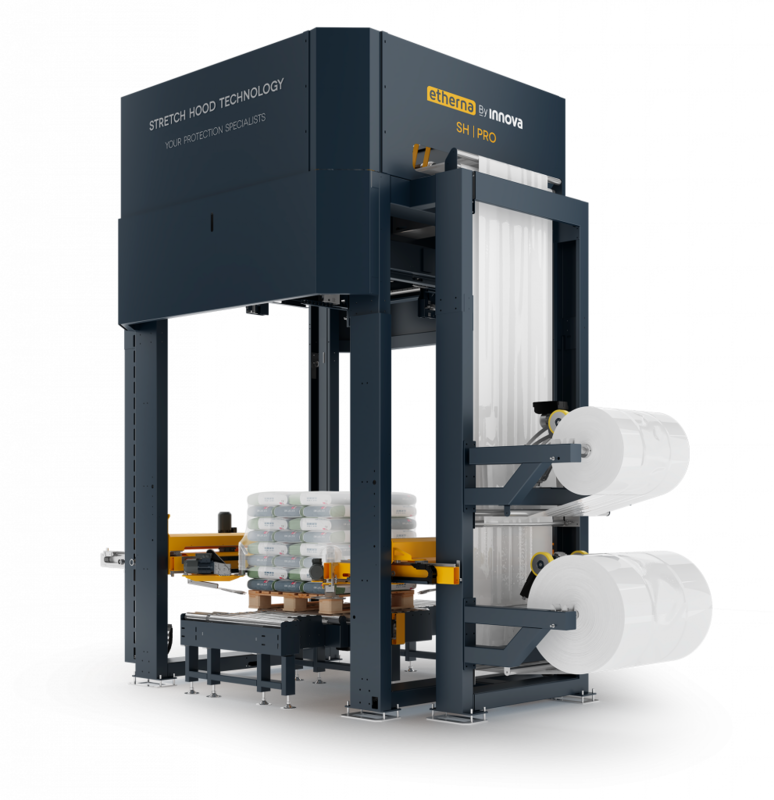 Stretch Hood is a highly efficient pallet packaging system that adapts to the dimensions of the load. This innovative pallet wrapping system offers more savings on consumables, faster hooding speeds, total load protection, safety during transportation, and a top-quality finish that gives added value to your palletized product. Why choose Stretch Hood technology? The Stretch Hood system lets you save up to 50% on consumables and energy for production. Stretch Hood film offers total protection for transportation and storage, being water-, dust-, and UV ray-resistant. 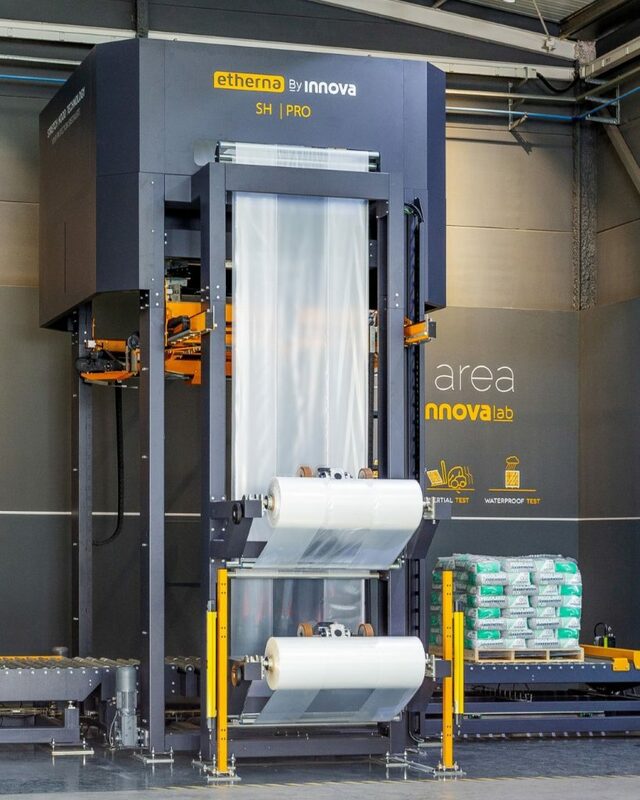 Stretch Hood is one of the fastest packaging systems around—you can wrap up to 150 pallets/hour. With Stretch Hood wrapping, your load stays secure and stable to avoid shifting, falls, or breakage during transportation. The completely transparent wrap offers greater visibility for your brand as well as code legibility, giving added value to your product. With Stretch Hood film, cutting and removing the packaging is quick and simple. In addition, it allows for easy detection of any tampering or intrusion. Stretch Hood uses a tubular film that automatically adapts to the dimensions of the product without the need of heat application. On the other hand, the heat shrink-wrapping system uses a gas oven to heat and shrink the film at a high temperature so that it adheres to the pallet. Stretch Hood consumes less energy than heat-shrink as it does not use gas and avoids wasting film, using the exact amount required. The Stretch Hood system does not use any kind of combustion, so that the fire or explosion risks implied by gas installations are eliminated. Stretch Hood wrapping is adaptable to all kinds of loads, including those that can deteriorate from the heat from shrink-wrapping. Stretch Hood wraps faster by avoiding the heat shrink-wrapping phase, reaching production levels of 150 pallets/hour instead of the 60 pallets/hour of the shrink-wrapping system. The finished Stretch Hood-packaged product has a perfect appearance, without creases or wrinkles. In addition, there is no risk that the wrap and the load will adhere to each other. The Stretch Hood system wraps the pallet using a tubular film that automatically adapts to the product and protects 5 sides of it. On the other hand, the automatic wrapping system wraps the product using more film, and then a cover is required to protect the top of the load. Stretch Hood implies savings on film use, since the wrapping system requires more wrapping cycles or the use of a cover. The properties of Stretch Hood film offer watertightness and protection of the load against external factors such as wind, dust, UV rays and even moisture and rain. Stretch Hood packaging is completely transparent, as only one layer is used, allowing greater brand visibility and label legibility. Any tampering with the load once hooded is easily detectable, as Stretch Hood only requires one film layer with no wrinkles or film accumulation. In addition to offering complete transparency, the Stretch Hood finish is top-quality, avoiding unnecessary plastic or leftovers. Why use Stretch Hood for my product?